Rates: around $125 - $150 depending on day of week. Tell them DoorCountyNavigator.com sent you! The Water Street Inn in Ephraim (formerly the Evergreen Beach Resort) is under new ownership as of 2015, and the new owners have done a tremendous job of remodeling this historic property. We toured the property in detail and met with management to discuss this “new” historic inn. All new bathrooms, with walk-in showers and all new tile floors and walls. Walls of the rooms were replastered, and the drop-ceiling tiles replaces with plasterboard for a clean and brand new look. All new tasteful carpeting; new mattresses and box springs; all new furniture, lights and blinds. 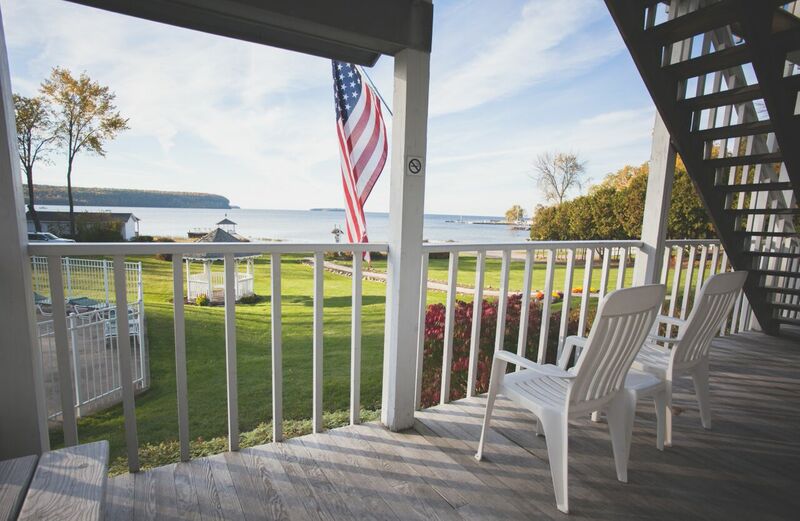 All the rooms of this 26 room resort have all new bathrooms (2015), have individual heating and cooling systems, brand new doors with a key-card system, 42 inch smart TVs (most atop of chest that has a built-in mini-fridge), microwave, a Keurig coffee machine with a supply of Door County Coffee, and completely new bathrooms, as mentioned. The rooms are similar, yet individual touches make each a little different. Nice. 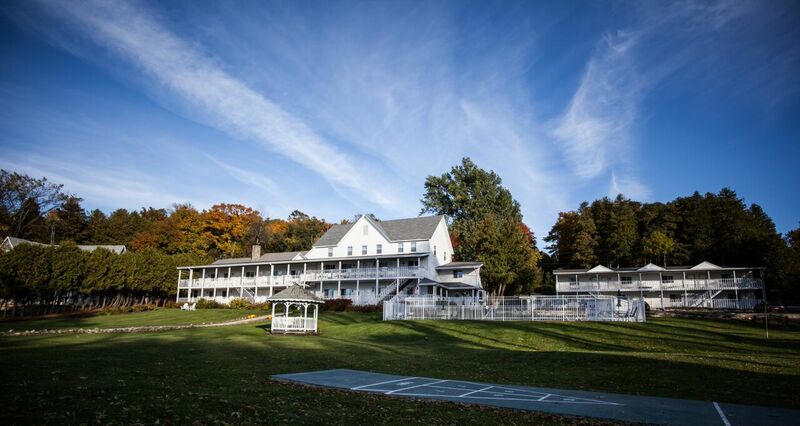 And all 26 rooms have a water view – some better than others – but all have a water view. We toured many. The grounds are beautiful with flowers, a shuffleboard, heated swimming pool (pool towels are provided), yard games (like bocce ball) and a gazebo. DoorCountyNavigator.com reviewers wanted to see sample rooms that represent what is offered. The main building has two floors as does the side building. The two buildings are about 100-150 feet from the road, so there is potential for road noise – however – we tested the road noise from each room by closing the windows and doors and it was quiet. So no issue here. Room # 109 is in the main building, and has two queen beds, dark wooden headboard, contemporary bed linens, 2 wicker sitting chairs, armoire for clothing, and the chest with drawer that TV sits upon. Tasteful, clean, new. The bath, with sink outside the shower and toilet area (which we like – easier for a couple of people to get ready for a fun day out). All amenities apply as we detailed above for all rooms. Room #206 also in the main building, has two queens, simply appointed, nice artwork too, and all the amenities mentioned above. Sink outside bathroom. Very nice. Room # 201 is in the main building too, and is a very large room with two queens, and all the amenities above. Same bathroom set-up, with sink outside bathroom. This is a very comfortable room – book it! The side building has better water views from the upstairs rooms, as the downstairs rooms face the water but also the parking lot. So cars in the lot may block some water view. Room # 7 in the side building is a large king bedroom, with sleeper sofa, wicker table and chair, armoire and all the amenities that accompany every room. Same bathroom set-up with sink outside the shower/toilet. DoorCountyNavigator.com staff was very impressed with Water Street Inn for the tremendous effort in rehabbing this historic inn to original glory, the friendly staff, and focus on comfort while maximizing the water views and offering beautiful grounds for sitting and playing. We give this inn a big thumbs-up and know you will like it too. So book a room right now, and be sure to tell them that DoorCountyNavigator.com sent you to them! Office hours: June 1st – October 31st 8:00a.m – 8:00p.m.